In this blog post we are going to see, how to achieve dynamic polymorphism in c# using interfaces through a small game simulator called “War”. The simulator is simple and straight forward to play. The user just need to select a weapon and click on “Attack”. Let me explain some theoretical background about “Dynamic Polymorphism” before dive into implementing the Game simulator. To put in a simple terms, Dynamic Polymorphism means changing the behavior at run time. Let us see an example of what does it mean. If a dog smells a cat, it will bark and if it smells a food, it will salivate. Here, the smelling sense of the dog is same. But depending on what does it smell, it change its behavior. Hope now you are aware of what is mean by dynamic polymorphism. Just stop reading and think what is the dynamic polymorphic behavior here in the “War” simulator. Yes, you are absolutely correct!! The Attacking behavior is the dynamic polymorphic behavior. The behavior of attack button will vary with respect to the weapon the user has chosen. Fine.. Lets dive into the code!! Rename the “Form1.cs” file to “MainForm.cs” and Click “Yes” to let the Visual Studio to do the renaming for you. 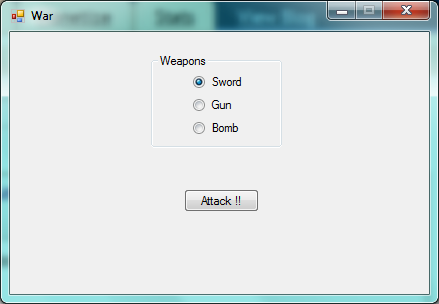 Add three radio button controls inside the groupbox and change their “Text” Property to Sword, Gun and bomb respectively. Add a button control and change its “Text” property to “Attack!!”. The Final Finished will look like the screenshot in the beginning of this blog. These classes represents the actual weapons and that we are going use in our simulator. Each of these classes will implement the IWeapon interface and provide the implementation code for the “Attack()” method. The Attack() method will show a message box with a text saying the weapon name being used. Now the stage is set for the real show. Let us wire the code of MainForm.cs and make the “War” simulator. Add a private instance variable of type IWeapon in the MainForm class and initialize with the sword class. This will hold the reference of current weapon being used Note: Sword is the default weapon. Now we are going to add event handlers for the weapons radio buttons. They will change the reference stored in the instance variable “weapon” to the respective Weapons class. Add the checked change event for all the radio button and their event handlers will look like as follows. In this blog we have seen a basic real time example on implementing dynamic polymorphism. You can download the source code of this sample from here.